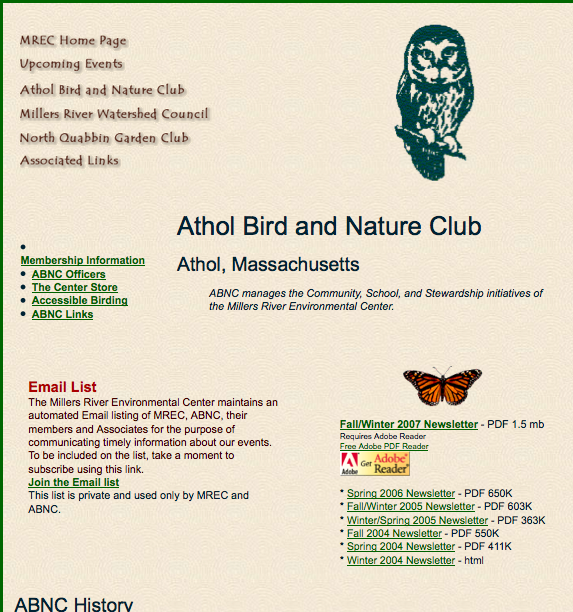 The Athol Bird and Nature Club needed an upgrade to their existing website, millersriver.net, originally created in 2002. The website was difficult to manage, and had an outdated look as well as non-accessible design. ABNC has a vibrant and active educational program and monthly events, but none of that was reflected on their former website. The staff and volunteers had more or less given up on trying to update the content of the website. The only part of the original website that had up-to-date information was the calendaring system, which was based on an old web utility last updated in 2009. There was no search feature, although the site had lots of great content dating back into 1999 that was essentially undiscoverable. In early 2013, I migrated the site to WordPress.com, and they chose a new domain name that more clearly represented the club. Of several designs, they chose one with a moderately responsive design, incorporating dynamic content features in widgets. Rotating header images added to make use of the site more dynamic, as well as visually interesting. Menus are now dynamic with multiple levels, rather than a long bullet list. A news feature displays on the main page automatically via RSS feed. Google Calendar was used to allow scheduling of room reservations as well as live display of the calendar on both pages and in widgets. This calendar can now be synched with MS Outlook or other email-scheduling systems. Membership forms were re-designed with a Wufoo form that integrated PayPal Payments and stored all entries in an online database. Additional forms were added that allowed users to receive an email confirmation copy of their submission, as well as conditional formatting to show/hide questions based on responses. The all-volunteer staff received on-site training on how to use WordPress. The permission structure of WordPress user roles allows multiple users to review each others work before publishing.